Miss Fake It 'Til You Make It: What’s a Quick Fix for Irritated and Bumpy Skin? What’s a Quick Fix for Irritated and Bumpy Skin? Ever wonder why the change of seasons results in irritated and congested skin? Well the answer lies in your biological response to Mother Nature. Part of your complexion is responding to the unregulated heat being pumped through buildings, while the rest of your face is fighting the blasts of cold as you walk out into the street. The issue is further complicated by the drastic shift in weather as warmer winds attempt to return and grasp on to mild temperatures as long as possible. As a result your skin is in a perpetual state of confusion, becoming over dried one minute, then pumping up increased oil production the next. So you ask, now what can I do to balance my skin? On days our skin needs some extra attention, we turn to X Out® Acne Wash-In Treatment. It’s a multi-tasking skin remedy that can be used as a cleanser, leave-on spot treatment or quick 10-minute mask. It didn’t over dry our skin and we saw results after the first application. You don’t stuffer through Fall until your skin catches up with Winter. Anything we can do to prepare for winter? Coming in December, get excited for an innovative cleaning device that puts a new spin on clean skin. 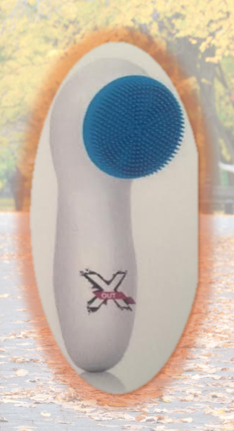 X Out Xtra Clean Brush is an electronic spinning brush that blasts dirt and oil off the surface of your face, leaving pores clean and refreshed. You can use it with your favorite cleanser to help balance your skin, while amping up your regiment for maximum efficacy.